The morning started with a quick breakfast at the hotel and then we went in search of a mechanic that stocked some headlight globes. Jarrod’s and my bike had both blown globes over the previous two days. These would turn out to be the only spare parts we would use on the bikes the whole trip which reinforced the decision to pay a little more for the bikes. It’s also not surprising that we did blow a couple of globes as we had all ridden the whole trip with the headlights on. The locals found this incredibly odd and between the flashing headlights on the Hwy or the pointing at the headlights every time we stopped, they couldn’t get their heads around it. For us it was peace of mind that others could see us coming and we could always see each other in the rear vision mirror even in traffic. We quickly found a mechanic that stocked some and for 50,000 dong ($2.50) we picked up two new globes and made the changeover. Once done, and after again being reminded by the mechanic that our headlights were on we hit the road about 7:30am. The mornings ride was easy-going. The road was wide (although often covered by drying rice) and the weather was cool. Having taken a beating from all the pot holes on Hwy 1 and Hwy 14E the day before some of the tyres needed to be pumped up so we were also on the lookout for somewhere that might have a bike pump. Luckily we found this brilliant little roadside cafe that was situated right next to a petrol station and got what we were looking for. It was also a good chance to give the backside a bit of a rest. Mr. Maintenance being put to work on the old fashioned pump. For OH&S reasons Shaun and I decided it was better safer just to sit back and watch while Mr. Maintenance attended to the bikes. 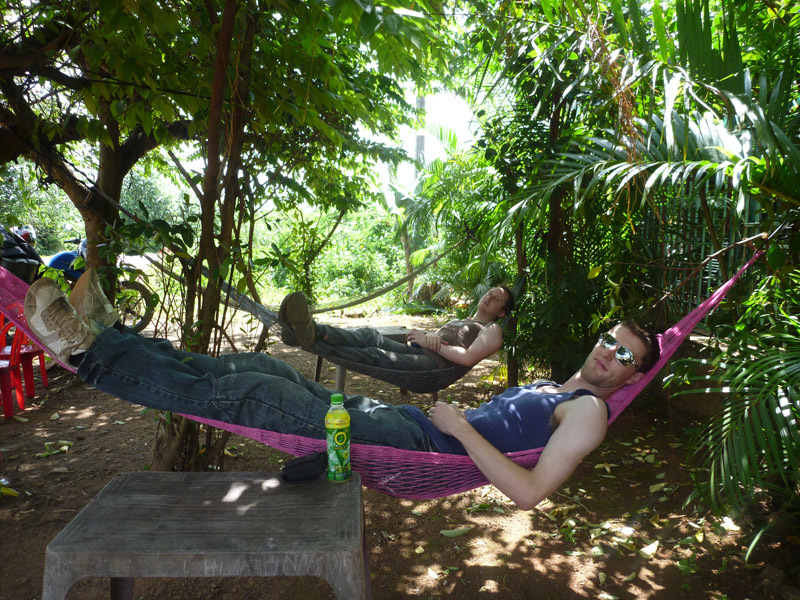 Unfortunately it was decided that we couldn’t just spend the rest of the day lazing around in hammocks so we continued on down the Ho Chi Minh Trail. 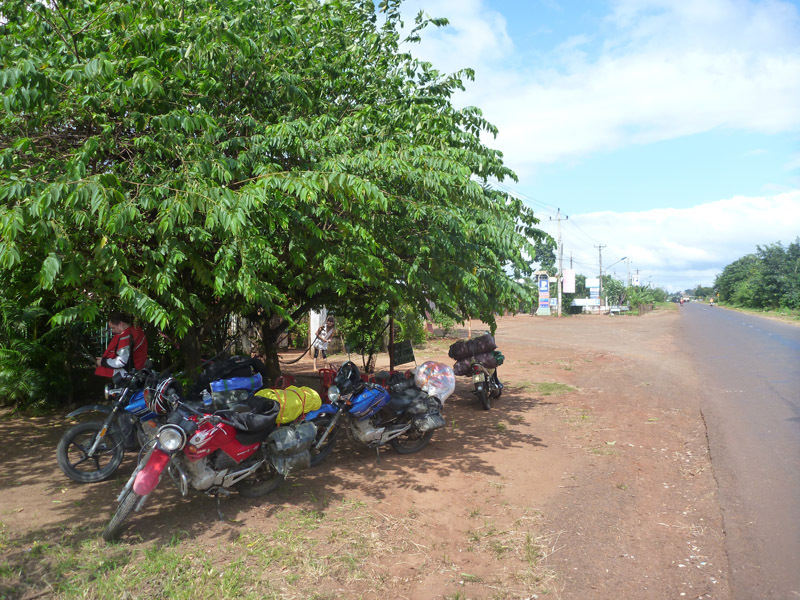 The main Hwy continues to Buon Ma Thuot and then Hwy 26 heads east back to Nha Trang. As you can see below the roads overlap somewhat and we decided to take a shortcut across to Hwy 26 that would save us about 30kms. It turned out to be a bad decision. 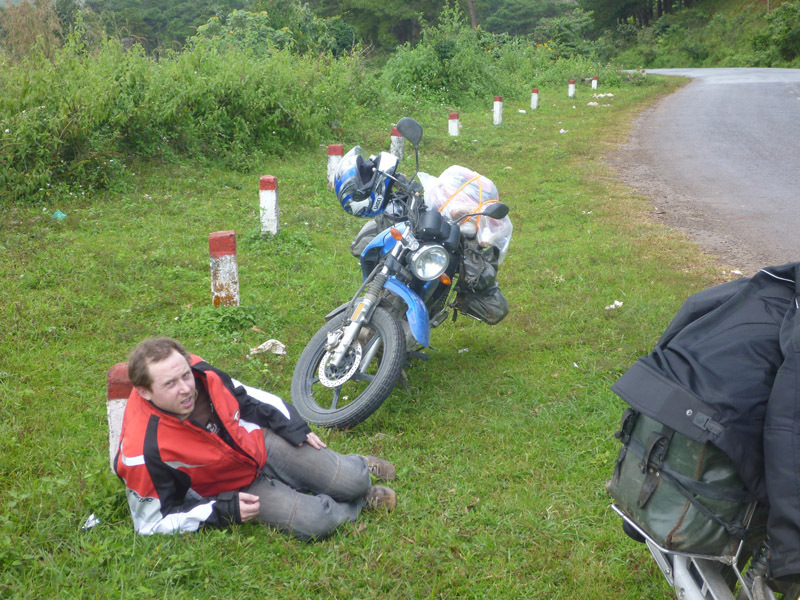 The road was like a motorcross track with pot holes big enough to bury a bike in. The 20km long “shortcut” would end up taking us and hour and a half to complete. By the time we hit Hwy 26 we were all exhausted. Shauno really feeling the days ride. Note the guy in the background of this photo. He’s sitting in the middle of the road, on a blind corner repairing his bike. 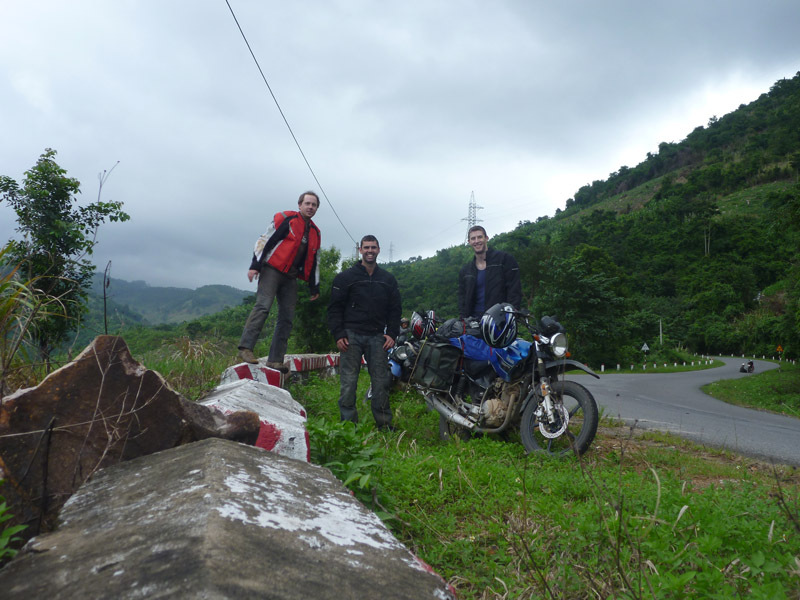 The ride along Hwy 26 quickly changed from jungle covered mountains to rubber plantations as we got closer to the coast. Although riding through the hills covered in rubber plantations can be an enjoyable ride we were back to dealing with the suicidal tour busses and had to stop on numerous occasions just to get out of sync with them. Although they were travelling faster than us in a straight line we had a far easier time overtaking through the windy sections and would keep catching them only to get stuck behind as they swerved all over the road to avoid pot holes. Whenever possible we would find a decent spot to stop and just cool the nerves and have a break from the mayhem. By 4pm we hit Hwy 1A again and were all relatively exhausted after what had been a very long day. Again the going on Hwy 1 was incredibly slow with traffic and road works. 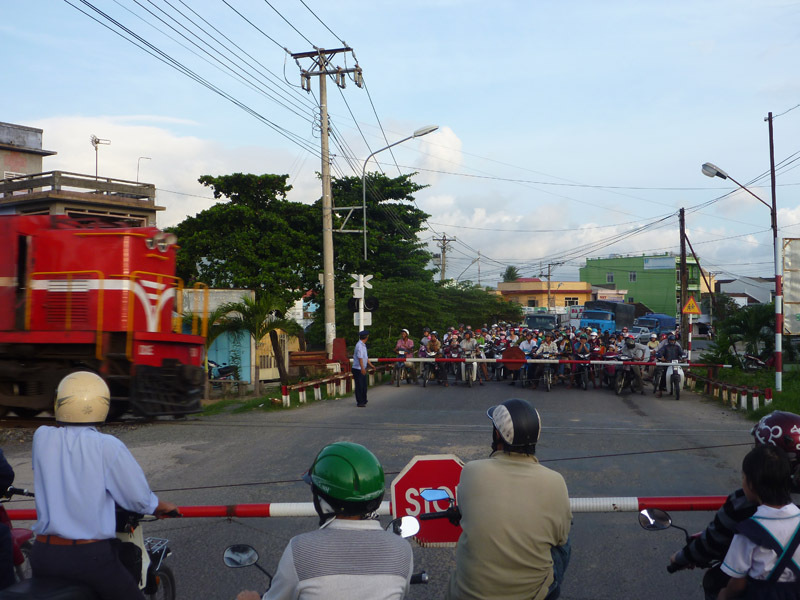 We did get an interesting experience at a train crossing through. With the boom gates down we watched as one guys spent 10 minutes with a small trowel cleaning all the dirt and stones out of the crossing before the train came through. It was about now that we were thankful that we’d replaced the headlight globes. 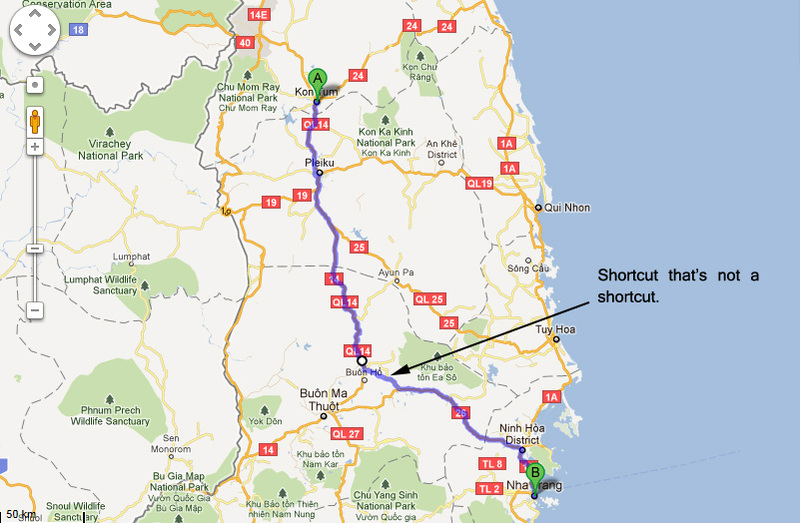 It got dark with about 5kms to go to Nha Trang city which was about the same time the hassling started. Stopped at a set of lights we were approached by a pushy gentlemen on a motorbike that insisted we follow him to his hotel. We told him we had one organised and continued on but this guy would not take the hint. He followed us like a maniac for the next 2km honking his horn and weaving dangerously in and out between trucks and busses nearly causing multiple accidents. It wasn’t until we hit the edge of the city that he finally turned around and left us alone. 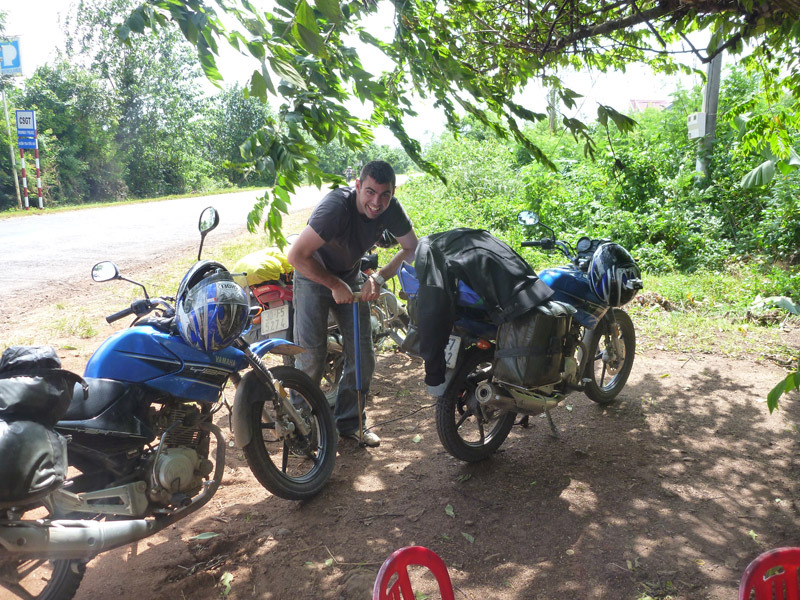 We made our way to the Nha Trang Beach Hotel and packed up the bikes for a couple of days of relaxation. The hotel was nothing special and the aircon leaked like a tap but the location was great and at only $25 a night we couldn’t be bothered looking anywhere else. As you should be doing in a beach side town like Nha Trang we found the nearest seafood restaurant and settled in to some brilliant seafood baskets containing pippies, crab, small lobster and king prawns for a huge 130,000 dong ($6.50). From there we hit the Red Apple Bar and Jarrod and I settled in to what would be the first really big night of the ride. We met a group of Argentinian backpackers and played pool and drank with them until the early hours of the next morning. Oh, i waitting for next part hehe. Thank guys. Thanks. I’ll try to get the last 3 days written up and posted in the next couple of days. Keep living the dream, Man!